Printed electronics applications are moving from the R&D Laboratory to the manufacturing floor in a wide range of commercial markets. It is certainly not living up to the marketing hype, but it is, like many successful new manufacturing technologies, fading quickly into reality. It appears that OLED displays will now be the first big driver, after a couple of false starts. MicroFab has supported research for over 10 years in using ink-jet printing to produce OLED Displays. 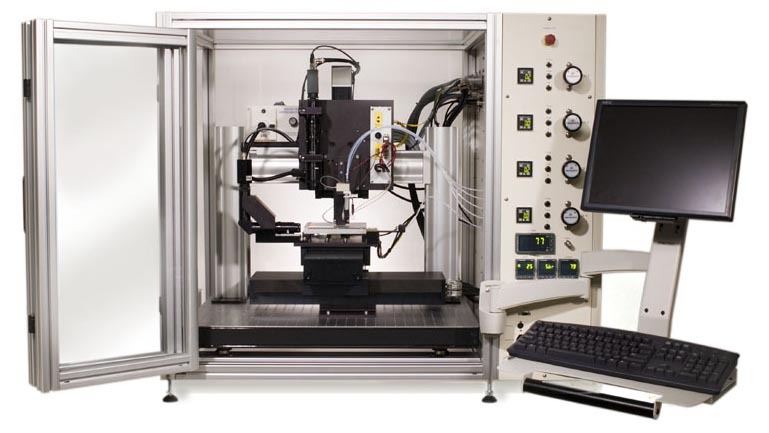 Our printing platforms have been used (1) in the development of solution processed OLED inks & the optimization of these inks for reliable jetting; (2) in studying the interaction of the ink with the substrate & optimizing the drying process to eliminate the coffee ring effect; and (3) in creating prototype displays. MicroFab’s JetLab® II shown at the right has been the platform used for most of these studies. Color displays are composed of pixel structures for the three primary colors. The photo shows a microscopic view of the polymer OLED display screen combined with a hand held display shown in operation. The dielectric barrier layers are formed on the ITO anodes to create the wells into which the polymer OLED solutions were printed to produce the display, which was created by DuPont Displays (presented by DuPont at IS&T on Sept 30, 2002 ). 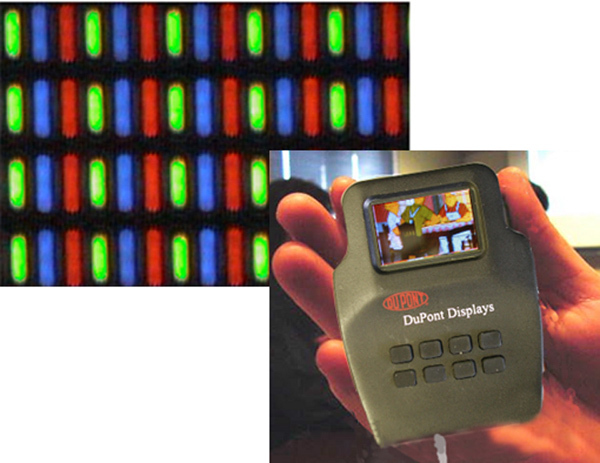 A passive matrix display and the printed layer arrangement of the organic polymer materials can be understood by viewing various websites on OLEDs. An example is shown in a presentation by Osram on the various OLED technologies that shows ink jet printing usage where applicable. In considering the several procedures used in manufacturing OLEDs, it should be noted that solution processed OLEDs can have a significant economic advantage for display manufacture. Evaporative deposition of all the materials in an OLED stack requires separate vacuum chambers for each material shown in the above website, and shadow masks for the three colors. An idealized view of printing rather than evaporating the color emitting materials into the wells is shown here, where the individual droplets deposited in the wells fill them to form the three different colors making up a pixel. Layers of the materials deposited in an OLED stack are nanometer thin as shown in the Osram presentation . The three images shown here represent Dektak profile images of light emitting polymer solutions that were printed at MicroFab on a JetLab® II to determine thickness of forced dried spots from solutions of different compositions and to observe flow and leveling of the dried material. All three spots are of the same OLED material at the same solution concentration, but with minor changes in the solvent mixture used to dissolve the OLED material. The drop on the left evaporates quickly and the coffee ring (thicker edges) effect is seen. The dot on the right evaporates more slowly and leaves the maximum height in the center. 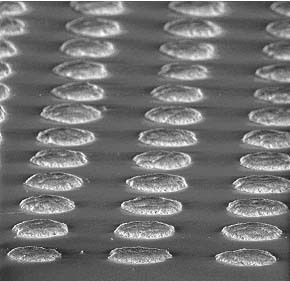 The dot in the center is approximately 50 nanometer thick and shows the flow and leveling desired for film uniformity. The Marangoni effect, which is most pronounced in the left spot, is mitigated by solvent selection in the center spot. MicroFab has also explored the application of ink-jet printing technology to other materials of interest in displays manufacturing (see Publications). Both phosphor based displays and polymer light-emitting diode displays could benefit from the use of ink-jet printing technology as a manufacturing technique. The left image shows 150um diameter spots of metal oxide particles. The right image presents spots of phosphorous particles deposited by ink-jet printing.